Whatever the time of year, there is nowhere like the English Lake district. We offer you a warm welcome to Elim House, a family run guesthouse, serving fresh home cooking in a pleasant comfortable atmosphere. 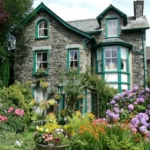 Built approximately 150 years ago from traditional Lakeland stone, Elim House is ideally situated in a quiet road, perfect for a peaceful break. Whether you want an energetic walk in the surrounding hills, a gentle stroll down to the lake and shops (5 minutes away) or a leisurely drive through spectacular scenery, Elim House is the perfect base, ideally located on the very edge of Bowness town centre. The warm and friendly welcome you will receive is complemented by individually heated and tastefully furnished en-suite rooms. All rooms have colour TV's hairdryers and tea & coffee making facilities. Elim House has a welcoming breakfast room where guests can choose from a comprehensive choice of menu. Vegetarians are well catered for and those with special dietary needs can also be accommodated (prior notice is requested). Catering for couples of all ages, single guests and motorcyclists all welcome at Elim House. Secure storage is available for motorcycles and bikes.